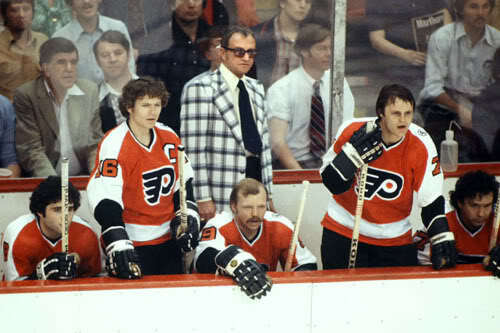 Despite being shorthanded six times, the 12th-seeded ’74-’75 Philadelphia Flyers came out on top here in Game 3. They were shorthanded three times in the opening period alone and Guy Lafleur finally made them pay in the final minute of the first after Rick MacLeish was called for hooking. This gave the top-seeded ’78-’79 Montreal Canadiens a 1-0 lead going into the second period. Longtime Flyer captain Bobby Clarke equalized for Philly just about five minutes into the second period with his 10th of the tournament. Then, with a little less than five minutes left in second, MacLeish made up for his penalty by giving the Flyers a 2-1 lead, which was his sixth of the tournament. The score was still 2-1 late in the third period when Ross Lonsberry was called for unsportsmanlike conduct at the 16:43 mark, putting Montreal on the PP again. Right before that penalty was about to end, Dave Schultz was given a 5-minute major for cross-checking and a 10-minute game misconduct. He has been ejected in all three games in this series. Anyway, the Canadiens basically spent the last three plus minutes on the PP, but Bernie Parent and the Flyers defense stood tall to hold on for a 2-1 win. Going back to the number of PP’s, which were 6 to 1 in favor Montreal, it was pretty impressive by Philadelphia that they held the Habs to just 22 shots on goal in the game. The Broad Street Bullies are on the board and it happened because they were able to slow down the Canadiens’ attack for the first time in the series. Tomorrow, the Avalanche will look to copy Philly’s performance and get on the board in their series as they trail the Oilers 2-0. This entry was posted in Semifinal, Ultimate NHL Playoff and tagged Bernie Parent, Bobby Clarke, Dave Schultz, Guy Lafleur, Montreal Canadiens, Philadelphia Flyers, Rick MacLeish, Ross Lonsberry, Semifinal, Ultimate NHL Playoff. Bookmark the permalink.